With his recent exhibition ‘Painting The Light’ at 5th Base Gallery in London, Terry Ffyffe presented paintings which marked both a new development in his work and a return to his earliest inspirations. Educated by the Marist Brothers, he returned to Catholicism via a spell in a Buddhist monastery. A move from Australia to Britain then brought recognition as a figurative artist with an increasing focus on religious paintings culminating in a series of twenty five large paintings on the Passion of Christ. Whilst painting the Resurrection event, using free, broad, colourful strokes to represent the transcendental light emanating from the Risen Lord, Ffyffe had an epiphany that took him back to his more abstract beginnings. As a result he returned to the work he had left before going to the Buddhist monastery. 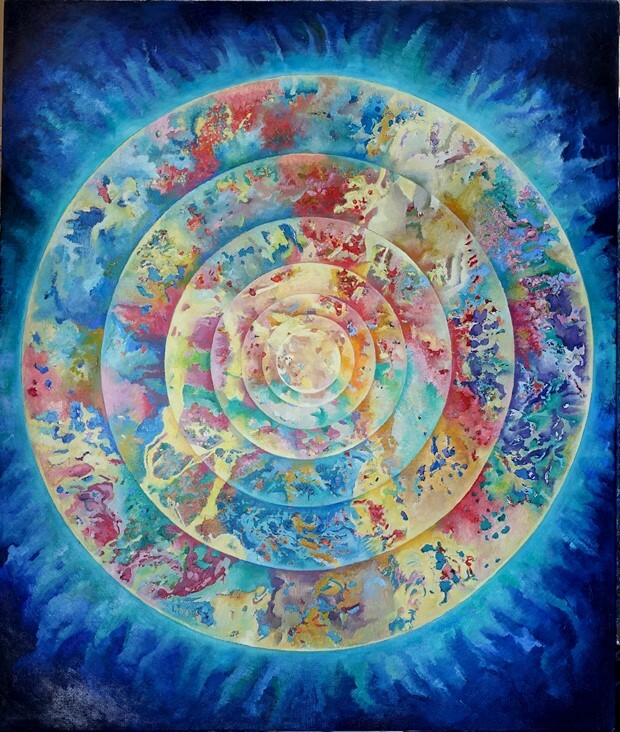 No longer emulating other artists or working in a derivative style, he was inspired by ‘personal experience in meditation and the images we see coming via the Hubble Telescope, The Liga project and the electron microscope.’ In these new light-filled oil paintings he combines the science of Quantum Physics with mystical spirituality to create what Edward Lucie-Smith has described as ‘whirling, dynamic abstract designs,’ revealing the patterns of nature. My first response to these new works has been in relation to their sense of the fragmentary: these fragments, whether geometric shapes or free-flowing patterns, are linked and united to form a harmonised whole. Terry's art is, therefore, an art of reconciliation, a facet of modernism that is, I think, under-recognised in the visual arts whilst being more widely acknowledged as a facet of modernist poetry. David Jones, in describing his poem ‘The Anathemata’ said he had fashioned a ‘coat of many colours’ from a ‘series of fragments, fragmented bits, chance scraps’ that had come his way by this channel or that influence. With a similar intent Ffyffe’s Background Radiation fashions his fragments in such a way as to hint at the shape of a hidden cross. A key aspect of what Ffyffe calls his ‘cosmic art’ comes from his experience of meditation: of entering the world of ‘liquid light’ where the realization of the unity of all things, the reconciliation of fragments and the oneness of all creation becomes certain knowledge. It is this that he depicts so powerfully in Shield of Faith where the pulsating rhythms of creative energies radiate outwards as protective fields of force that form the globe, with a shield of light around it. My second way into these works is through the sense that Ffyffe is inspired by organic patterns in nature, both at the micro and macro levels. Inspiration has come as he has looked through the telescope and the microscope. Indeed, one understanding of the rectangles in Background Radiation could be to see them as microscope slides. He believes that the patterns of the micro in nature mirror those of the macro, that the patterns and shapes of particles match those found in the great expanses of the universe. Gaudí famously suggested that ‘originality is returning to the origin’ and as a result based his buildings on a simple premise: if nature is the work of God, and if architectural forms are derived from nature, then the best way to honour God is to design buildings based on his work. That, I believe, has real synergy with the inspirations for Ffyffe’s new work and is a key reason why these paintings themselves are so inspiring. 1. Terry Ffyffe: Shield of Faith, oil on linen, 100 x 85 cm. 2. 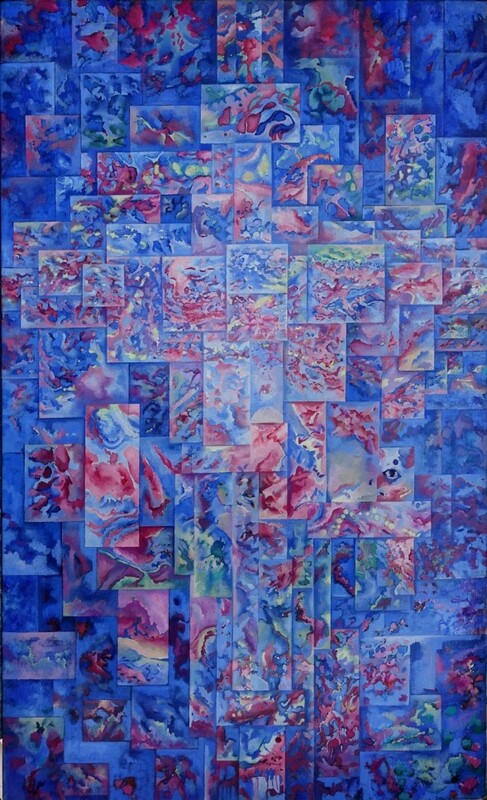 Terry Ffyffe: Background Radiation, oil on linen, 90 x 55 cm. Terry Ffyffe was born in Melbourne Australia in 1957. Educated by the Marist Brothers at St Joseph’s College he studied Art at Swineburne University. After living the bohemian life of a painter in Carlton, extensive travels in the Australian Outback and several solo exhibitions, Ffyffe came to England to study the ‘Old Masters’ of European Painting at first hand. Unknown in England, he painted portraits to support himself while he developed his uniquely expressive style eventually coming to the attention of the art critics Edward Lucie Smith and the late Daniel Farson, who introduced him to the world of Francis Bacon and the ‘London school’. He won a number of national competitions including the Discerning Eye before he was taken up by the Lamont Gallery. He has exhibited in Sweden, Australia and Belgium and has work in private collections in Ireland, Belgium, Sweden, Japan, Australia and the United States. He has been variously described as a ‘visionary’ and ‘an idealist with a strong belief in painting’.